Get in touch - any questions? We would love to hear from you! Welcome to Jericho Kitchen Cookery School. If you haven’t heard about us yet we are a young, vibrant and enthusiastic cookery school that opened its doors in January 2015. We run our classes in our state of the art kitchen in Warborough, which is our family home and also the Warborough B&B with 3 luxury ensuite rooms upstairs. As we continue to grow we have been lucky enough to have several other venues that we use in Oxfordshire, including most recently The Miele Experience Centre in Abingdon. We also use Barefoot Cafe in Walton Street, Oxford and also in Woodstock for some of non-cooking classes and other evening events. Our ethos is simple – we love good food and want to share our passion for it with everyone. Our classes vary from food fermentation, Tapas, Moroccan, traditional British, French, cheese and bread making to name but a few. All our teachers are highly experienced and skilled and who share our love for imparting knowledge through informative but more importantly fun classes. Our classes are very much hands-on, fun, informative and relaxed – we provide all the ingredients, aprons and recipe packs – all you have to do is enjoy. We cook for about 2 – 2½ – hours then everyone sits down to enjoy the fruits of their labour! Time to relax and ask as many questions as you like!!! What happens when you come to one of our classes? All our classes are very informal, relaxed and hands-on, we feel that people learn more when they are enjoying themselves! You can get as involved as you like our teachers are highly experienced and there to guide you throughout the lesson. We are not a formal individual stations school we like to work around our central island or big table so although you won’t make every dish individually you will see everything that is going on! Our cookery school is a family home so you might think you have arrived at the wrong place! Up the long drive past the beautiful front garden full of herbs and fruit, you arrive at the front door to be greeted by myself, or one of the cookery school assistants. Tea, coffee and mineral water will be available to you whilst you get to know your fellow students. Next you meet your teacher or teachers! They will tell you a bit about themselves and also explain about the recipes, and some history behind it too sometimes, that you will be recreating together. We lay out all the ingredients on the table for you to see and then tend to work around the central island so that everyone can see what is happening. You won’t cook every single dish, we share out tasks and the teacher will stop and answer questions at any time that you may have as the session progresses. Sessions are also packed with top tips and advice to help you when you return home. One student exclaimed that one tip that was given was worth the price of the class alone!! Finally when everything is ready you will sit down and enjoy the fruits of your labour around the table and at this point your teacher will join you for any further questions that you may have. Like any good meal a lively conversation is so much part of the enjoyment so don’t be shy – ask away!! We are lucky to work with the following people! We also cater for corporate events and private parties. Get in touch, we would love to hear from you and come and join us on our food adventure! We hope that you visit us soon but do please do call us on 07753 316680 or email us on [email protected] if you have any queries! Please make sure you know which venue you are booked in to! What better way than to treat someone you know to a present of a gift voucher for a cookery class at the Jericho Kitchen. Whatever the event we can put together a gift pack individually tailored to the occasion. All vouchers are valid for 6 months so plenty of time to choose a class. If you have received a voucher and wish to redeem it then simply choose the class you wish to book, add to cart and then when prompted add your voucher (or coupon!) number and it will automatically book you onto that class. Don’t worry if are not at ease booking online and you need to help – just email me [email protected] or give me a call on 07753 316680 – I will get back to you straight away to solve the problem! just sit back and relax – your gift pack will be with you within 2 working days! There is no doubt about it if you want to bring people together from all backgrounds the one thing that will do that for you is food – whether it is making a meal together it or just eating it! Having already set up a cookery school here in Oxford where I successfully secured and run corporate events for Harley Davidson, Carlsberg, Cancer Research and Ogilvy & Mather – you are in safe hands. Just sit back and let us organise the perfect event for you and your team. So if you are looking for a team building corporate event or a just a fun day out for the team – we are just what you are looking for. 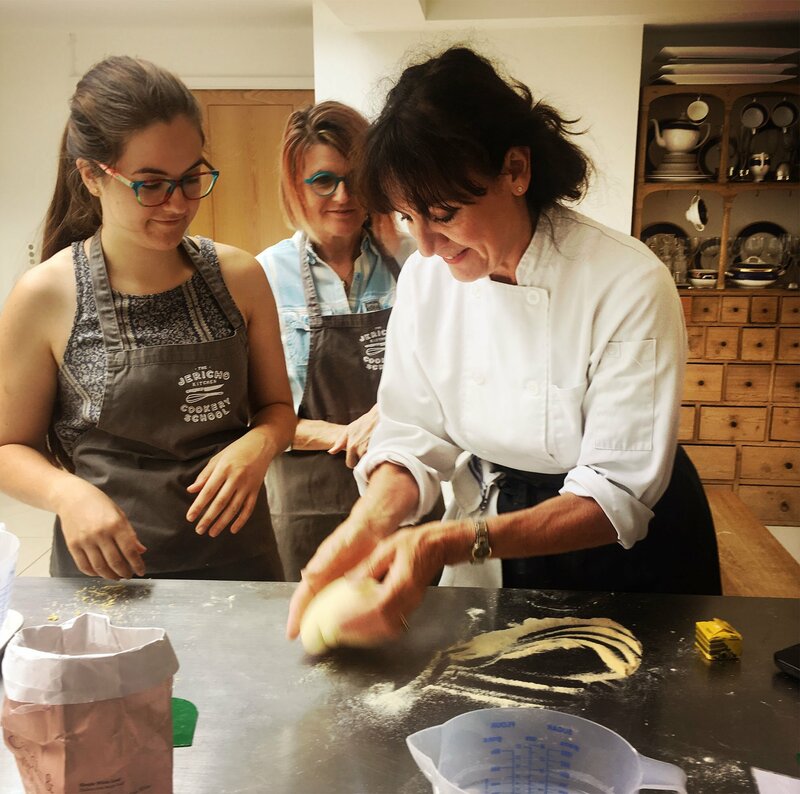 Here at the Jericho Kitchen Cookery School all our teachers have something special – not only can they cook but they are exceptional communicators themselves so your event will run smoothly and professionally but in a relaxed, fun and informative environment. Our state of the art kitchen is set in an acre of gorgeous garden just outside Oxford with several outdoor seating areas and ample parking and full disabled access. We can cater from between 8 – 14 people in the Warborough venue and larger numbers in the other pop-ups venues we use. On arrival you will have a brief introduction from the chef and then we get going! Cooking usually lasts about 2 – 2.5 hours and then finally you all sit down and enjoy your hard work with a glass or two of wine! For groups of 8 – 14 people prices range from £80 to £90 per person and for groups of 15+ prices range from £90 – £110 per person which includes all the ingredients and several glasses of wine per person with the meal. We can also personalise aprons with your logo should you wish at an additional cost. For information on all options available please just drop us an email through the contact us page.